This has the caveat "almost" because I think I worked out an answer but I must admit my electronics is a little rusty and I have a few sticking points so I thought I would post what I have found here, see if someone can validate a couple of things for me, the main thing being the pin out assignments of the LM393, another are the values of "Rt and Ct" for 3 Hz. As soon as I am reasonably sure I have a viable design then I'll order the parts, bread board it, wring out any issues and repost as a MOD with full instructions on how to do including the parts list and where you can get them. Objective: Turn on an X-10 Camera Systems with the ability to record only when the DS-7000 is Armed. 1. Armed light comes on, a relay will trigger for 1/4 second and "push" the ON button of a KR19A Keychain remote. 3. When the Armed light is flashing it will do nothing, the cam system will have already been turned on in Step 1. 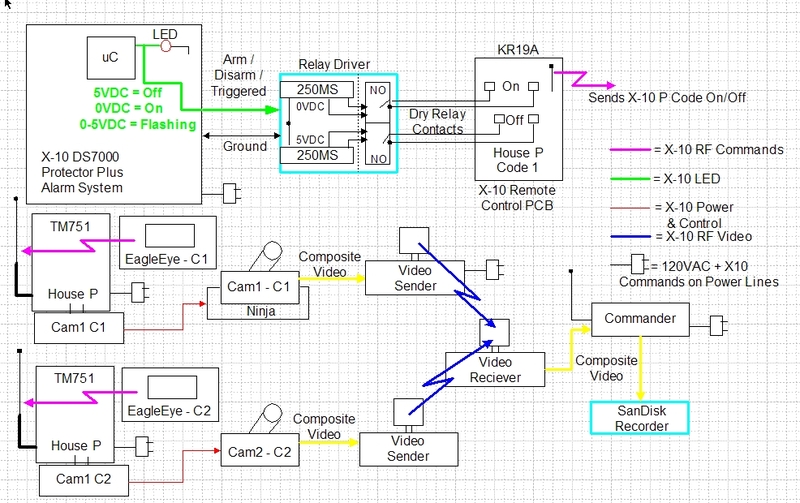 Before I get to the circuit, I will say I have tested all of this out but the circuit to detect the Armed state of the DS-7000, something when I started this I thought would be easy, but it turns out that other then in the microcontroller the DS-7000 is designed around the only place there is a solid "Armed" indication electronically is the LED that lights up. This all works perfectly if I push the On/Off buttons on the KR19A manually (or with a relay). So those are the three conditions I have to work with for this. when the systems is armed (Condition 1) and triggered. a SanDisk recorder to record. as the camera motion detector. the system was triggered while I was not home. 7. 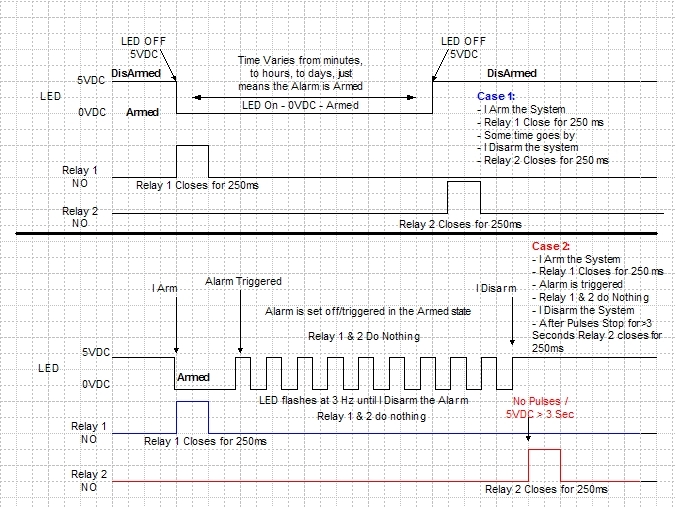 When I disarm the system the "Armed" LED will go out (After pressing Security Lights off. and power down the camera system. This works it will now drive off of any LED in the DE-7000, flashing or not it does not care. You can trigger any On or Off or Both from an LED going on or off, that is anything that can be controlled by a Keychain Remote. For the tests to this point I had the relays hooked to LED's to see the action. Tomorrow I will wire the contacts to the Remote Contacts. See links at bottom for what it looks like wired on the boradboard and to the DS-7000. 1. Power-Up and No Smoke! The entire circuit draws 8.6mA, 14mA when a Relay comes on but that is counting the LED lighting, so likely more like 10mA total so the DS-7000 will power it easily. I have now connected it to the Keychain Remote and that works perfectly also, so now the last thing is to see if I can cram all of this in to the DS-7000 case, if not I guess I will need a little box for it. 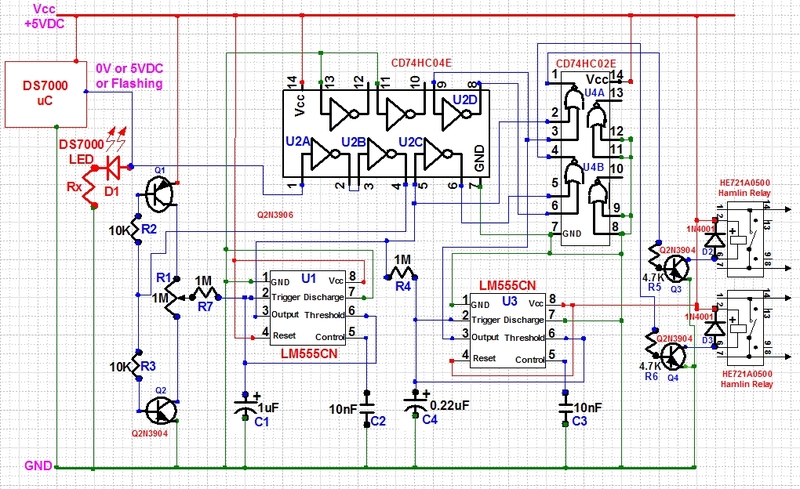 All I take from the DS7000 is +5VDC@ 10mA, Ground, and the Armed LED signal (0-5VDC). Note: Considerable credit goes to Jim Thompson from sci.electronics.design for his outstanding help! Others also pitched in but no where at the level Jim did, would have taken me weeks at least to figure this out without his help. Once I get this all polished up I will write a build guide step-by-step that will include: the parts list, where you can get them and additional application idea's.